Kaukauna’s Keaton Kluever celebrates his 2017 WIAA Division 1 285 pound win. Paul Stumpf photo. 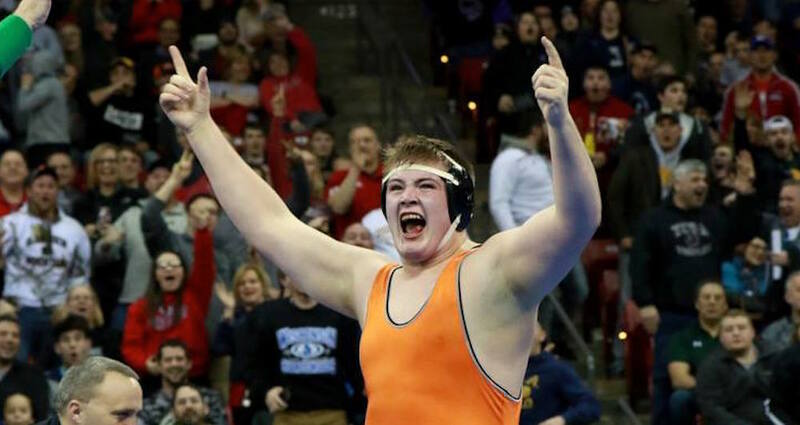 MADISON — Nobody appeared more stunned at what had just happened than Keaten Kluever after winning his 285 pound Division 1 WIAA championship match. Exhausted from battling Pewaukee’s Blaze Beltran, and behind 3-2 with moments to go, Kluever had one more trick up his sleeve. A takedown actually, that give Kluever his improbable win. Kluever quickly launched into celebration mode and circled the mat with his hands in the air while his coaches rushed to congratulate him. Trent Leon and Brandon Micksh of Kaukauna also made it to the semifinals but did not advance to the championship round. The Ghosts sent seven wrestlers to the individual meet, including Jon Diener, Zach Lee, Bryson Alsteen and Mason VanAsten. Kluever will return to Madison next weekend as he leads his team while the attempt to repeat as state team wrestling champions.